CA'BOYZ....one of these days i'll do this book. 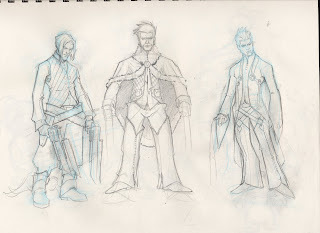 but, these designs are still too out there for what i have in mind. too anime, even tho' im lookin at anime for inspiration. one thing i like is the intertwining fabrics, i just gotta simplify. 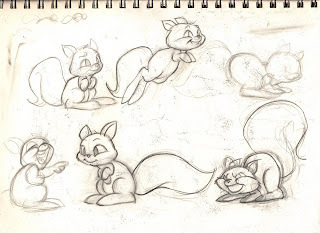 SKWERL....learning that classic animation style...been looking...okay watching alot of tom and jerry..man, stuff never old. PAW....the head piece is gonna go but i couldnt resist. the rest would probably stay for the cowboy book. im color testing this one so its in progress. 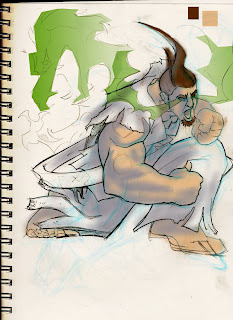 RYU....just watched a street fighter cartoon and bought back an oooold idea from my first 'superhero' comicbook. 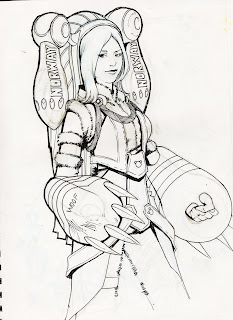 im gathering some idea's from that concept and bringin' back but i dont have any plans to do a book on 'em...just fun. plus im gonna finish coloring it.